I am so ready for cooler weather. It has been hot, sticky, and nasty humid here for months. Luckily the weather is supposed to cool down into the high 70's next week, which I am so looking forward towards. One thing I do love about summer are the thunderstorms. There is something so refreshing about a great summer thunderstorm. Everything becomes quiet, the temps drop, and for a few minutes everything is still. It's peaceful, calming, and a great refresher during a busy day. Thunderstorms might just be my favorite thing about summer. With hot weather comes cold desserts and drinks. My kids are in love with popsicles and they are so easy to make at home and cost a fraction of the cost of store bought. Plus you can use whole ingredients making them a delicious summer treat. 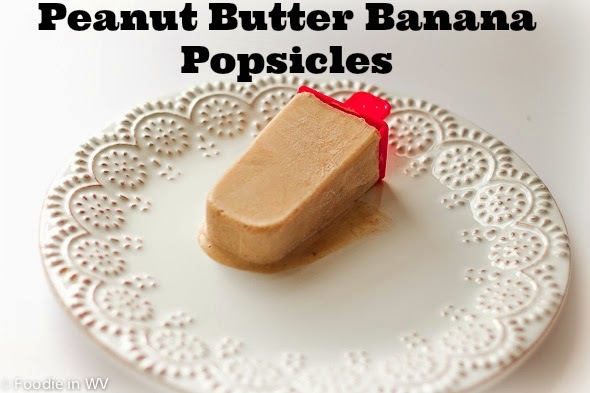 The following is my recipe for Peanut Butter Banana Popsicles. Adapted from Kroger mymagazine mailer. A simple summer dessert using fresh bananas and peanut butter. Only takes minutes to make. Cut bananas into 1-inch chunks. 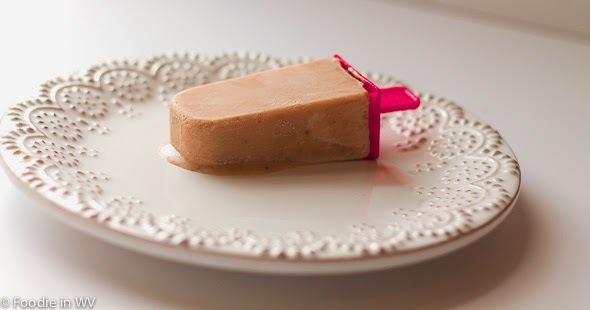 Spoon into an 8-serving popsicle mold and freeze until set, approximately 4 hours. If you don't have a blender a food processor would also work. I know a lot of people avoid granulated and brown sugar. I haven't personally tried this recipe with honey, agave etc., but I would love to hear if anyone tries and how it turns out! Run the popsicle mold under hot water to loosen the popsicles and they should pop right out. I have tried this recipe with whole and non-fat milk and they both set beautifully. I have not tried it with soy, almond, or coconut milk, but you are free to try and tell me if it works. I love yours popsicles look perfect and beautiful. My mold are really old I hope to find others because spring begin soon. And I would love to have others for the kids. I will save your recipe because Ilove them. These molds are actually from a Jello mold kit :) I just reuse them as regular popsicle molds. It works great and only cost a couple of dollars! It's weird because it was chilly here for a lot of August, but it's wicked hot & humid here since September rolled in. I wish it was chilly here. We have been pretty sticky and hot since May. I am more than ready for fall. I love fall!! I agree, I am so ready for the cooler temperatures predicted for next week. It's hot, humid and sticky down in North Carolina and I can hardly stand it!!! Oh and I love how easy this recipe is. It has my favorite combo: PB and bananas! Definitely going to have to buy a mold and give this a whirl. I'm glad someone got hot weather because it sure wasn't us. This was the coolest summer I ever remember having here. I'll trade you :) I don't mind the heat, but I can't stand the humidity!!! we are having some rain nowadays and Im loving it especially the drizze type. Coffee and a lazy afternoon is my fave. But when we have hot days, I make flavored ice cubes. Those are just fruit juices with some fruit bits frozen in ice cube trays. Will def try your popsicles. Im sure my girl would love it. I am a fan of drizzle rain too, at least that way you don't get soaking wet :) The flavored ice cubes is a great idea, I bet my kids would love them! Those look delicious! I don't share share your love of thunderstorms. The thunder scares me, but I do like the sound of a steady rain minus that thunder. My youngest is afraid of thunder also, so I understand :) He hates thunderstorms and refuses to go out of the house if we have one. Peanut butter and banana..a classic delicious combination! I love it!